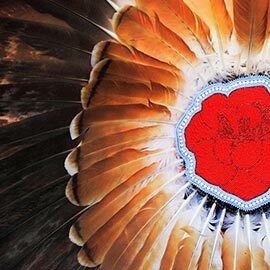 Waterloo – Wilfrid Laurier University invites the community to experience its annual weeklong series of events that highlight the contributions of Aboriginal knowledge to education. A series of events will take place from March 6-10 on Laurier’s Waterloo and Brantford campuses. “Aboriginal Education Week is an opportunity for the Laurier community to not only learn about contemporary Indigenous issues such as language recovery, but it is also an opportunity to experience Indigenous art, music, film and meet and develop relationships with a variety of Indigenous people through social events and doing workshops together,” said Jean Becker, Laurier’s senior advisor: Aboriginal Initiatives. All events are free and open to the public unless otherwise specified. The following are highlights of events taking place on Laurier’s Waterloo campus. For additional information, please contact, Corri Arnold at carnold@wlu.ca. An interactive reconciliation exercise that captures the events of history and its impact on First Nations people in Canada. 12:30 p.m., The Quad, outdoor area in front of the Fred Nichols Campus Centre. 4 p.m. to 6 p.m., Senate & Board Chamber. Contact Sara Matthews at smatthews@wlu.ca for more information. Join traditional hand drummers for some round dancing, learn how to side step and enjoy the music. 6:30 p.m. to 8 p.m., Paul Martin Centre. Free and open to the public – to register. Contact Corri Arnold at carnold@wlu.ca for more information. Join the Aboriginal Students Association and Laurier Students' Public Interest Research Group (LSPIRG), who will make soup and frybread. Noon to 2 p.m., 187 Albert Street, Waterloo. Contact ajewell@wlu.ca for more details. Learn about Indigenous traditions and stories with Faculty of Social Work elder-in-residence, Banakonda. 10 a.m. to noon, 187 Albert Street. Email Corri Arnold at carnold@wlu.ca to register. Learn stories of the Residential School and Absolon’s beloved mom, Jennie. The following events will take place on Laurier’s Brantford campus. For additional information, please contact, Bonnie Whitlow at bwhitlow@wlu.ca. 10 a.m. to 1 p.m., Aboriginal Student Centre, 111 Darling Street. Louise MacDonald, Our First Environment - A Woman’s Sacred Connection with the Spirit of the Water throughout all the stages of life. 11:30 a.m. to 12:50 p.m., Research & Academic Centre West 002. Lecturer: Professor Kari Brozowski. 5:30 p.m. to 6:50 p.m., Odeon Building 200. Noon, Aboriginal Student Centre, 111 Darling Street. 10 a.m. to 11:20 a.m., Research & Academic Centre West 203. For more information about Laurier’s Aboriginal initiatives, click here.